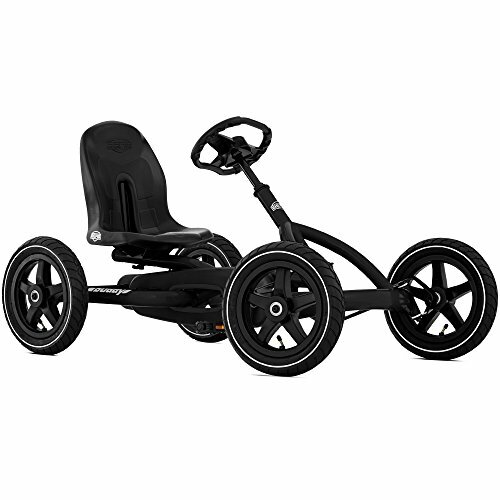 Enjoy great outdoor fun with the Bergâ€™s Buddy Go Kart â€“ Black Edition. Stylish and rugged, this pedal go-kart is perfect for budding adventurers ages 3 to 8 years old. Your young drivers safety is assured with the featured BFR( Brake, Forward, and Reverse) Hub that allows the driver to pedal forward, cruise, brake by pedaling back slightly and even go in reverse by pedaling backward. The rubber tube tires have a hybrid tread that can take virtually any surface while the sealed wheel bearings in the rims allow the kart to roll smoothly. A pin slides in to lock the adjustable seat into place to ensure that the driver is comfortable and safe even on the roughest terrain. Optional accessories like safety flags, horn, and a LED headlight are also available. Order from Dazadi now and get a 2-year manufacturer warranty/1-year manufacturer parts warranty against defects. Purchase Berg Buddy Pedal Go Kart – Black Edition at Discounted Prices ✓ FREE DELIVERY possible on eligible purchases. BFR HUB FOR WORRY-FREE DRIVING - The BFR ( Brake, Forward and Reverse) Hub allows young drivers to pedal forward and coast on momentum. They can also pedal back to use the coaster brake to stop and pedal backward to go in reverse. Recommended age: 3-8 years old. RUGGED WHEELS FOR ANY TERRAIN - Roll on any packed surface with the rubber air-filled tube tires with hybrid treads. The color-coordinated rims also contain sealed bearings keeps the kart rolling smoothly. Tires should be filled to around 25 psi and never to exceed 28 psi. SECURE, STURDY AND COMFORTABLE SEATING - The matching seat is engineered to be adjustable and sturdy. The seat post fits into a hole and is locked securely by a pin keeping the driver safe on any terrain. POPULAR ACCESSORIES AVAILABLE - Personalize your go kart with optional accessories like the safety flag, horn and LED headlight. WARRANTY - Get a 2-year manufacturer warranty/1-year manufacturer parts warranty against defects. You can also register your kart on bergtoys.com for a 5 year warranty.